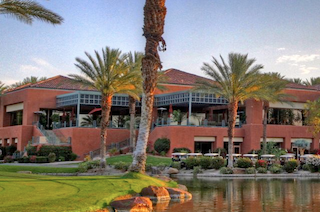 Indian Ridge Country Club offers a premiere lifestyle in a sought after Palm Desert location. 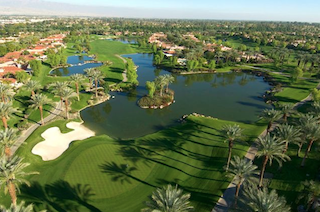 Set in Southern California's Palm Desert, Indian Ridge Country Club is an open-age country club community that is sure to impress active adult homebuyers. Desirable amenities include 36 holes of golf, a spacious clubhouse and a variety of outdoor recreations. Several special-interest groups also make it easier to socializing with neighbors and make new friends. Indian Ridge Country Club was opened in 1993, by the Sunrise Development Group, and completed in 2006. It features beautiful grounds, resort-style amenities and just over 1,000 homes. Homebuyers today can choose from available patio homes or single-family homes on either a resale or new construction basis. While the community is open to residents of all ages, its fabulous amenities make it an ideal choice for active adult retirees. At the heart of Indian Ridge, the 42,000 square-foot clubhouse offers an exciting line-up of amenities. Indoor and outdoor areas provide space for socializing, while fabulous restaurants provide both casual and fine dining. There are concierge services and social groups for a variety of interests, such as cards, book discussion, travel, photography, fashion and wine tasting. Indian Ridge Country Club boasts two 18-hole Arnold Palmer golf courses plus countless other amenities. The clubhouse's 22,000 square-foot fitness center is also a community highlight. It features cardiovascular and strength-training equipment, as well as an aerobics studio for group classes like yoga, Zumba, spinning and tap dance. After a workout, residents can relax and rejuvenate at the full-service day spa. Outdoors, resident golfers can enjoy challenging play on two 18-hole Arnold Palmer golf courses: the Arroyo Golf Course and the Grove Golf Course. Additional outdoor amenities include 34 swimming pools, 16 lighted tennis courts, two bocce ball courts, two lighted croquet lawns, a basketball court and the Rover's Ridge dog park. Homes at Indian Ridge Country Club were built between 1993 and 2006, by Sunrise Development Group. There are 1,068 residences within the community, letting homebuyers choose between available resale homes in a number of styles. Whether choosing a patio home or single-family design, monthly homeowners' association fees include 24/7 security, cable, roof maintenance and exterior painting. Attached patio homes were originally offered in six floor plans, ranging in size from 1,527 to 2,368 square feet. Each have a minimum of two bedrooms, two bathrooms and a two-car garage, while most also had the option of a den or third bedroom. The largest models offer three or three-and-a-half bathrooms, as well as oversized, two-and-a-half-car garages. Indian Ridge's single-family homes were originally built in 21 different floor plans, with sizes from 1,948 to 4,580 square feet. These spacious homes include two to four bedrooms, two to four-and-a-half bathrooms, and separate dens. Most models feature oversized, two-and-a-half-car garages, although some have smaller designs for just two cars. A prime Palm Desert location, beautiful homes and impressive amenities come together to make Indian Ridge Country Club a great choice for active adult retirees.